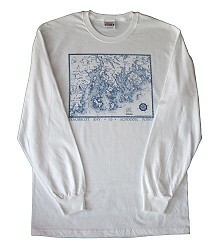 Designs include Penobscot Bay to Schoodic Point, sold below, along with 13 other map T-shirt designs available via email. Showing Downeast Maine's most intricate and beautiful stretch of coast, islands, and waters, Penobscot Bay to Schoodic Point is the centerpiece of Jane Crosen's one-color series of hand-drawn coastal maps. Individually hand-silkscreened on T-shirts, the map is as beautifully detailed and legibly printed on fabric as it is on posters and postcards. 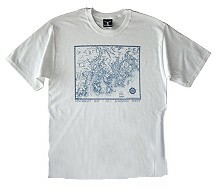 The design is printed on quality 100% cotton heavyweight (6.1 ounce) T-shirts in a rainbow of natural colors (including several pigment-dyes, noted below), with two effects depending on ink color: The map shows up well in dark blue ink on the lighter colors (White, Natural, and Sage), and shimmers like moonlight on water printed in white ink on the darker shades. Available in adult sizes S (chest size 34-36), M (38-40), L (42-44), XL (46-48), $18.95 each; XXLs (50-52) are $20.95 each. Available in adult sizes S (chest size 34-36), M (38-40), L (42-44), XL (46-48), $26.95 each; XXLs (50-52) are $28.95 each. (1) Email Jane asking about availability of the other map T-shirt(s) you would like to order, specifying the map title, short or long sleeves, and size. In reply, you'll receive a list of color options currently available for that map title and size. Confirm by return email the size, color, sleeve, and map title of the T-shirt(s) you'd like to order. (2) Place your order using the shopping cart, selecting the size, color, and sleeve of the T-shirt(s) you wish to order as listed under the Penobscot Bay design, even though you are ordering a different map(s) as confirmed available by email. When you get to the Checkout window, type into the Instructions or Comments box the map title, size, color, and sleeve of each map T-shirt you are ordering. Adult sizes S (chest size 34-36), M (38-40), L (42-44), XL (46-48)—$38.95 each.